Have you ever read a list of dog food ingredients and wondered what it all meant? Wondering if it’s a quality dog food? Most, if not all of us, want our Shih Tzu, or any of our pets really, to be healthy and eat quality meals, but aren’t quite sure how to read the labels on the back of the containers. In general, dog foods that are sold at the grocery store is of lesser quality than foods sold at a pet supply store or from online pet retailers. 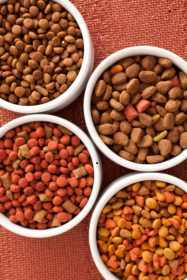 However, buying dog food from the grocery store is often more convenient for many people and, these dog foods are often more affordable than better quality pet foods. The number one thing you should look for when buying foods for your pet, no matter where you buy it, is the AAFCO approval statement. "XYZ product is formulated to meet the nutritional levels established by the AAFCO Dog Food nutrient profiles for growth and maintenance." AAFCO provides minimum standards for dog food ingredients, and their manufacturers, so you know that foods carrying this statement is a complete diet. But remember that these are minimum standards so just because the container has the AAFCO statement on its label does not mean that it is great, however it is better than one that doesn’t have it on the label. There are also some ingredients that you should search for, while others should be avoided if possible. If the first ingredient is corn, then you know that there is more corn in the food than anything else. Dog food experts have say good foods should have a couple of meats listed in the top five ingredients . It should preferably be listed first, showing that it’s the largest ingredient, by weight before processing. Your dog is able to digest meat protein from, chicken, lamb, turkey, fish, beef and venison more easily than protein from corn or other grain sources. Meat is the clean flesh of chicken, turkey, lamb etc. This includes the tongue, heart, esophagus. The term “by-products” is the clean parts of animals other than meat. These include lungs, spleen, kidneys, brain, livers, blood, and bone, stomach and intestines. Doesn’t that just sound yummy? Well to a dog it doesn’t sound all that bad. So if you decide to go with a dog food which contains by-product, the better choice is to pick one that specifies which animal it came. If you can avoid a by-product entirely and go with a dog food which list, for instance, beef, carrots, rice as its ingredients, this would be a much better choice. Real vegetables, whole grains, and real fruit. Dogs can derive health benefits from certain unprocessed vegetables and fruits in their foods, such as sweet potato, carrots, and blueberries. Some unprocessed fruits and vegetables have anti-oxidant properties which are good for your dogs health. They should never be a main ingredient, but in small amounts are beneficial to your dogs diet and provide some nutrition. Every dog needs a bit of oil and fats in their daily diet. Look for foods that use chicken fat, flax seed oil, canola oil, any food that has Omega-3 and Omega-6 fatty acids. Many lesser quality foods contain generic animal fats and you really don’t know what the ingredients are, it could be any animal. Instead, look for named sources of fat. Avoid artificial or chemical preservatives like Ethoxyquin, BHA and BHT. Look for foods with natural preservatives like Vitamin C and Vitamin E instead, also known as Tocopherols. Corn is a popular food ingredient in most grocery store brands of dog food. It’s even found in some premium foods. 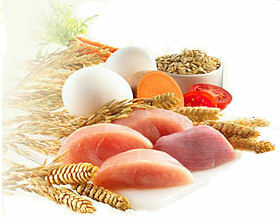 It’s used because it is a less expensive source of protein than meat protein. But it’s not the most nutritious ingredient...and it should never be the first ingredient in your dog food. Dogs are not vegetarians and they don’t digest vegetable matter particularly well, in fact your dog only digests about 50 percent of the corn he eats, meaning the rest of the corn (corn meal, ground yellow corn, whole corn, etc.) passes through his gastrointestinal tract and doesn’t get the nutrients from it, the rest you pick up as waste in your yard or when you walk him. Flavorings are often added to food to make it taste better, but they are not a necessary part of the dog food. Read the food labels to find out what types of flavorings are added. The best type is a specific broth or stock, try to avoid unspecified flavorings or artificial ones. Avoid artificial color and sweeteners. Your dog just doesn’t need these in his diet. 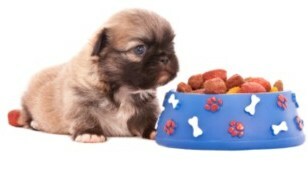 Before I found out about the importance of good dog food ingredients I was feeding our Shih Tzu Cesar dog food. On a routine visit to the vet, she asked what were feeding them, and gently suggested that they may fare better with a more nutritious and complete dog food. I’ve been reading labels ever since. It took a little trial and error, but I found the best dog food I could that they will actually eat, cause let’s face it, what good is having the high quality ingredients, if they won’t eat it. There is so much information about dog food ingredients available, that it really is beneficial for not only our dogs, but for ourselves, to learn all we can about keeping our precious fur-babies healthy, and making sure we know exactly what we are feeding them. To learn more about the dangers of dog food check out "Dog Food Ingredients Secret", you may just be surprised what your dogs are eating in some commercial food. It has really opened my eyes to how important it is to know exactly what we are feeding our beloved pets, and how we can keep our precious little fur-babies healthier.